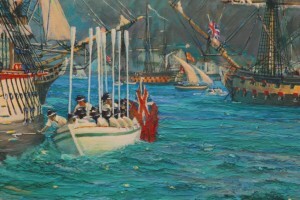 Looking for the very best in modern marine painting? 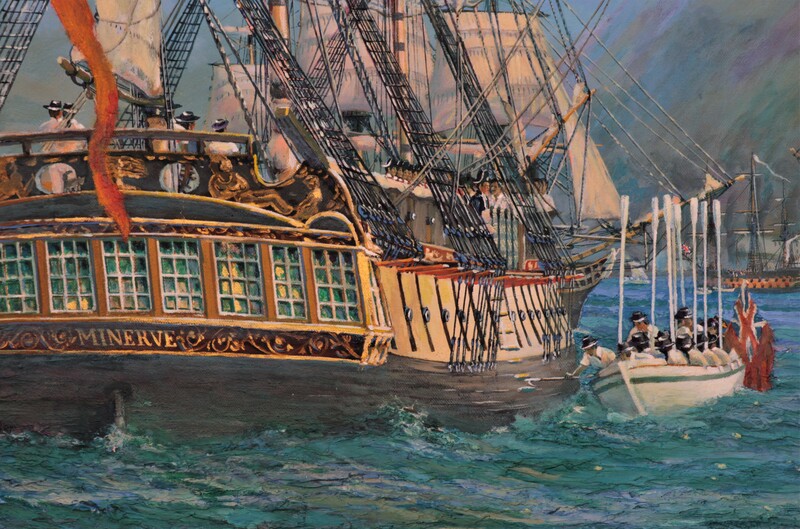 Nelson, why is Nelson said to be ‘immortal’, Nelson’s HMS Minerve voyage gives us clues. 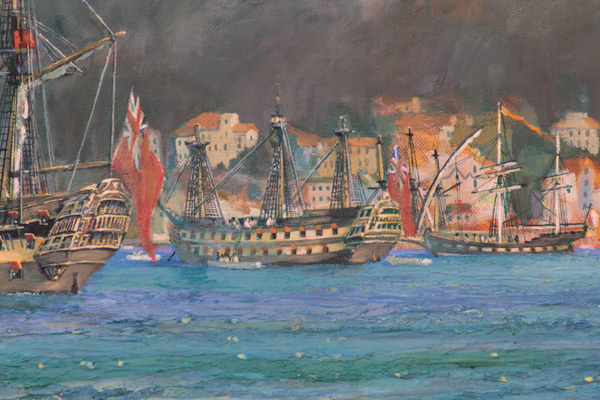 “Nelson at Gibraltar” by Gordon Frickers measures 46 x 91 cm (18″ x 36″), oils on canvas. You may find this painting more affordable than you first guessed. 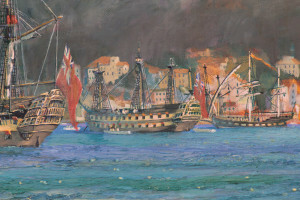 This Minerve marine painting shows Nelson at Gibraltar, 10th December 1796 where he transferred from the 74 gun HMS Captain. HMS Minerve was the beginning of the voyage that consolidated Nelson‘s name, made Commodore Nelson and his Admiral, Sir John Jervis celebrities, truly Internationally famous. Nelson and the ‘HMS Minerve‘; Gibraltar, 10th December 1796. 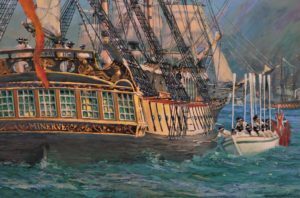 The “Nelson and Trafalgar Collection”, my brief from Victory 2005 Ltd on behalf or HMS Victory and the Royal Navy Museum, Portsmouth, was to show some of the lesser known but significant events in the story of Nelson and the Royal Navy. Nelson’s transfer to the frigate HMS Minerve was the beginning of a special assignment, the voyage that consolidated Nelson‘s name, made him and Admiral Sir John Jervis celebrities, truly Internationally famous. Yet many of the books on Nelson don’t mention Nelson’s crucial time on the frigate Minerve. 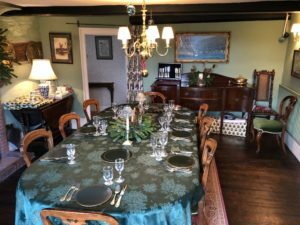 You can find this story in the now rare copy of Captain A. T. Mahan‘s “Life of Nelson”, published 1897, still one of the most definitive accounts, more accurate than many more recent books. My copy is a second edition , I treasure it. 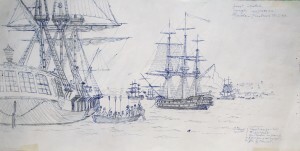 My efforts at meticulous research included a visit to Her Majesty’s Hydrographic Office, Taunton [HMHO] to review period watercolours and charts of Gibraltar, made by R N officers as aids to navigation. The research for this marine painting included Nelson’s route to the battle of Cape St Vincent where he changed the course of the fight and captured 2 Spanish ships by a Technic later referred to as “Nelson’s patent boarding bridge“. The painting started life as a quick sketch I made one evening while enjoying a quiet beer at the Royal Plymouth Corinthian Yacht Club. Actually I had in mind a scene of the French discovery voyage, sent to emulate Captain James Cook, showing Laperouse arriving at Botany Bay. Further research into his time of arrival scotched this sketch. I hope you will agree, it has not been wasted. 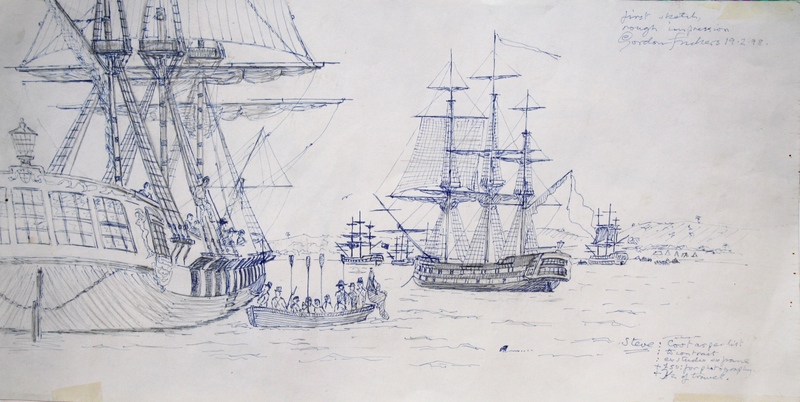 The sketch drawn 19.02.1998, that lead to “Nelson at Gibraltar”. Love to own this painting? Payments can be made in easy stages, ask Gordon Frickers for details. 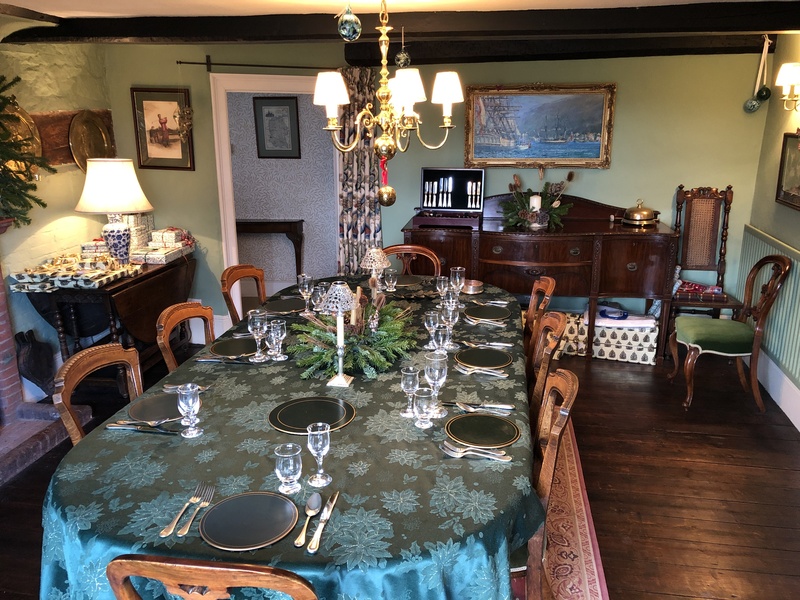 Incidentally, there is an incident during the voyage with Minerve, ‘borrowed’ by the most famous of naval author’s C S Forester for his character Horatio Hornblower, in “Hornblower and the Atropos“.